Anthony Fooks grabbed all four tries as Portsmouth defeated holders Trojans 29-22 in a thrilling Hampshire Bowl final at Rugby Camp. Fooks swooped for his crucial final score two minutes from the end of a close-fought encounter to edge the host club home. He had already notched a hat-trick with a pair of catch-and-drive tries and another from a kick and chase. Trojans, however, showed throughout they were not going to give up their title without a fight. 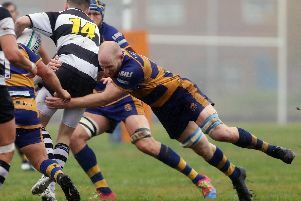 Portsmouth director of rugby Jim Pearce felt both teams deserved credit for the way they played in difficult conditions. ‘It was an important day for the club and nice to pick up some silverware,’ he said. ‘Considering the weather it was well supported and the two teams deserve credit for the good game of rugby they produced. ‘In all seven tries were scored in difficult playing conditions. ‘Trojans came intent on playing rugby and we had to show good resilience to overcome them. ‘After our disappointing league defeat at Warlingham we wanted to see an 80-minute performance. Trojans struck the first blow after only three minutes when their number eight, Alex Williams, scored the first of his hat-trick of tries. He gathered a crossfield kick to touch down in the corner. Portsmouth responded quickly by grabbing their opening try just three minutes later. Both teams scored further tries leaving Portsmouth 14-10 ahead at the break. It continued to be a see-saw affair with the lead changing hands three times in the second period. With five minutes left, Morgan tied the scores at 22-22 with a penalty. And in a thrilling finale the Trojans full-back fumbled a Morgan kick and Fooks pounced for the winning score. Pearce added: ‘We are hoping this success will spur us on to bigger achievements. ‘In two weeks’ time we play our RFU Senior Vase tie at Old Cranleighans and if we win that we will be within two games of a Twickenham final. We are also third in our league and still in with a chance of promotion. ‘It emphasises just how important the depth of our squad is. Players are pushing for places. ‘Some of them will be disappointed at not getting on against Trojans but it was a tight situation where we didn’t want to make too many changes. ‘The players are showing they are ready to keep going right to the end.